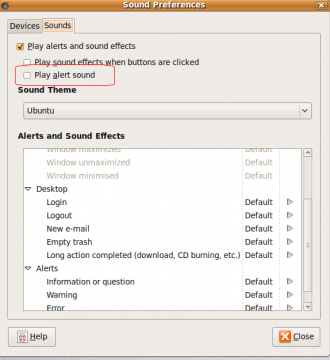 You may be tired of system beep ,or you just want to change your ubuntu login/logout sound effects,and I will tell you how to do it easily in this tutorial. For login or logout sound effects,at Alerts and Sound Effects box,find the line and click on Default,select Custom to change it in menu. 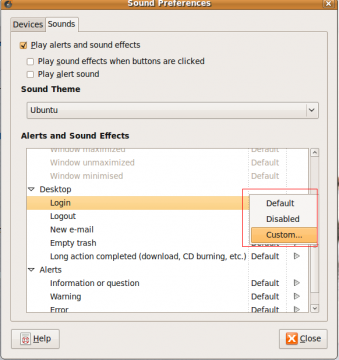 5 users responded in " Disable system beep and login/logout sound effects in ubuntu "
o.k whenever i open up my sound preferences i get five tabs with sound effects, hardware, input, output, and applications.. instead of the two that are shown in the screen shots on this page. anyone know what the problem is?? I also have the five tabs in Lucid. It’s because you’re both in Lucid. Some version after Jaunty started using a new version of the sound preferences that is easier to use, but has way less settings. It really pisses me off. This doesn’t work. It resets every time you reboot. 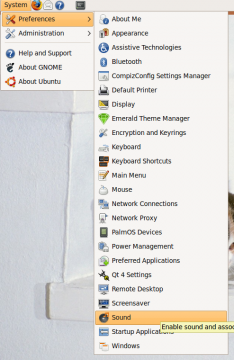 Yet another reason why linux will always be a third rate OS.